Readers to Eaters, 9780983661542, 32pp. 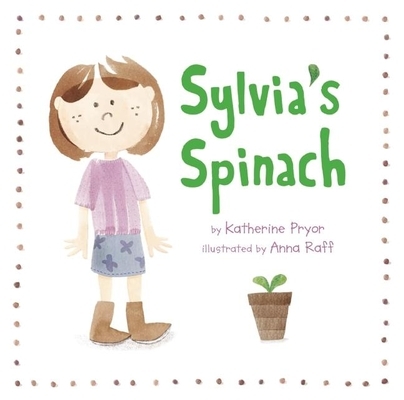 Katherine Pryor made her picture book debut with Sylvia's Spinach, which has been widely used for nutrition education and school garden curriculum. Anna Raff's many children's books include "World Rat Day" by Children's Poet Laureate, J. Patrick Lewis. Katherine and Anna teamed up for their second book together, Zora's Zucchini, published in 2015. Sylvia's Spinach was named among "15 Books for Future Foodies" by Food Tank and is a Whole Kids Foundation Book Club selection for September 2016. Katherine Pryor is a good food advocate and made her picture book debut with Sylvia's Spinach, which is now widely used to support nutrition education and school garden curriculum.She has managed a program to bring local and healthy food to Washington State hospitals and is the co-founder of South Park Fresh Starts, which grows vegetable starts for a food bank in Seattle. Visit katherinepryor.com. Anna Raff has illustrated several books for children, including World Rat Day by Children s Poet Laureate, J. Patrick Lewis. Her illustrations have also appeared in many newspapers and magazines, including the New York Times and the Washington Post. Before her career as an illustrator, Anna was a designer at the Metropolitan Museum of Art and several children s book publishers. She lives in New York City. Visit annaraff.com. Katherine and Anna teamed up for a second book, Zora's Zucchini, published in 2015.